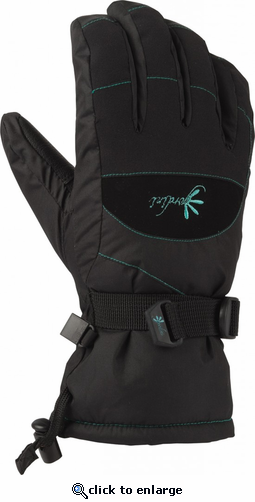 The Gordini Lily Glove will keep your hands dry while you ski, shovel snow, and have snowball fights with the kids. Aquabloc provides the waterproofing, keeping snow from getting in from the outside. A Hydrowick lining gets rid of sweat, so your hands don't get wet from the inside. The Lily Glove is also ultra breathable, reducing the chances that sweat will crop up in the first place. For dexterity, Gordini gave the Lily Gloves flexible fabric, a pre-curved design, and dura-grip palm. Flex fabric with breathe weave stretch woven fabric, dura-grip palm, fingers, thumb, and wrap caps. Megaloft® insulation and Hydrowick microdenier lining with thermo-plush lining inside the cuff, and ultra breathable, waterproof, windproof Aquabloc® insert. Aquabloc®, Megaloft®, gauntlet cinch closure, wrap caps, palm and thumb reinforcement. Gordini has been in the outdoor business since 1956 and has been striving to create products to keep your body’s heat production and heat loss in perfect balance. Their team of winter sports enthusiasts based in Vermont and Canada will settle for nothing less than perfection when it comes to creating quality and functional products that combine proven natural materials with the latest in synthetic technology. The result is the best products to keep you warm and dry in the toughest conditions. InSilk® is Gordini’s exclusive silk insulation. As nature’s premium insulation, it is a hypoallergenic, all natural, renewable resource that is highly breathable, will not compress or get wet and features climate controlled properties; keeps you warm when the mercury drops and cool when temps rise. 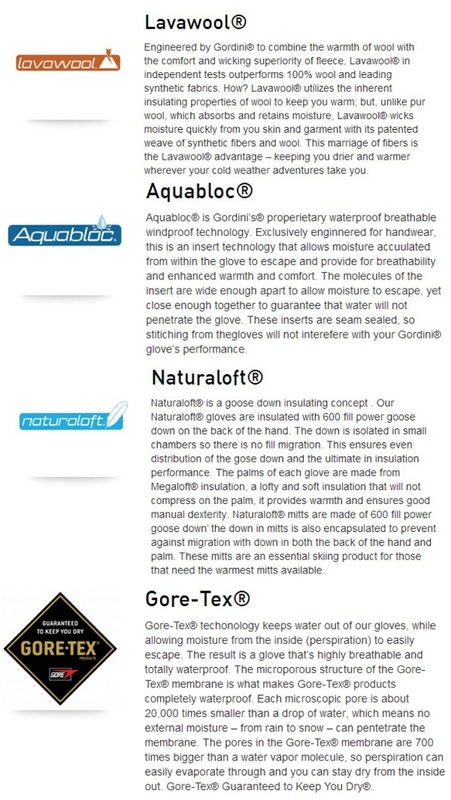 Many of our gloves and mitts are made with waterproof membranes and fine leathers and therefor it is not possible to machine wash or dry clean them. However you may wipe the product clean with a damp cloth and then dry away from a direct heat source.